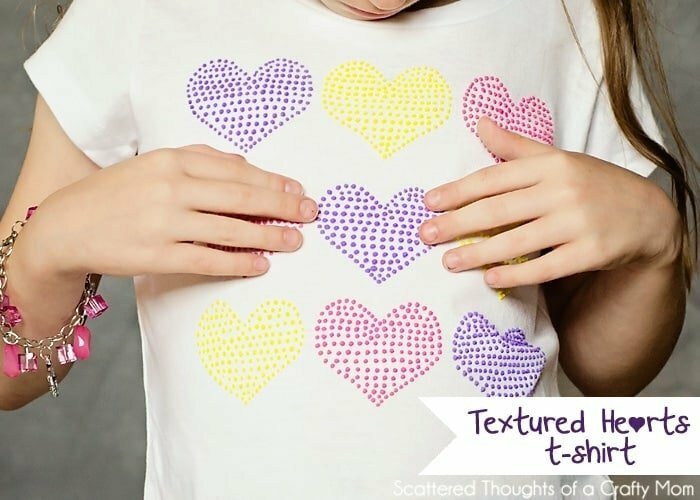 Today, I am sharing how I made this adorable textured hearts t-shirt with puffy paint and a freezer paper stencil. As I’ve been moving my craft room upstairs, I’m coming across all sorts of little projects that had been cast aside or just on my “to-do later” list. In this particular case, I have an entire shelf dedicated to projects that just need a quick fix. So… I’ve been doing all sorts of boring stuff, taking in/letting out waistbands, hemming, fixing buttons, patching holes…. Most of them too boring to blog about. 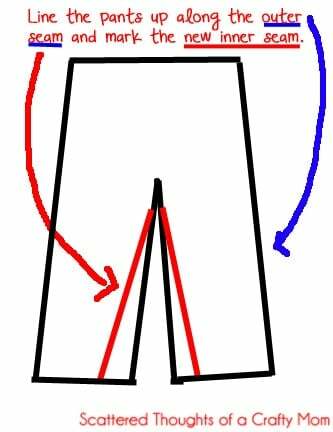 One of the quick fix project were these knit pants from target, they were always a favorite and had held up well. (I’m guessing they are about 4 yrs old.) Look familiar to any other moms out there? I got to work turning these into skinny leggings… All I did to fix the pants was to line up a pair of leggings that fit on top of the old pants along the outer edge. I marked the new inner seam line and basted along that line. After finishing up the pants, she needed a new top that coordinated. I had a package of Tulip puffy fabric paint and the colors were a perfect match to these pants. I normally use the soft fabric paint and a foam brush to paint on fabric, but I didn’t think that would work as well with the puffy paint. I figured dotting the paint on the fabric would be a great way to show off the texture. 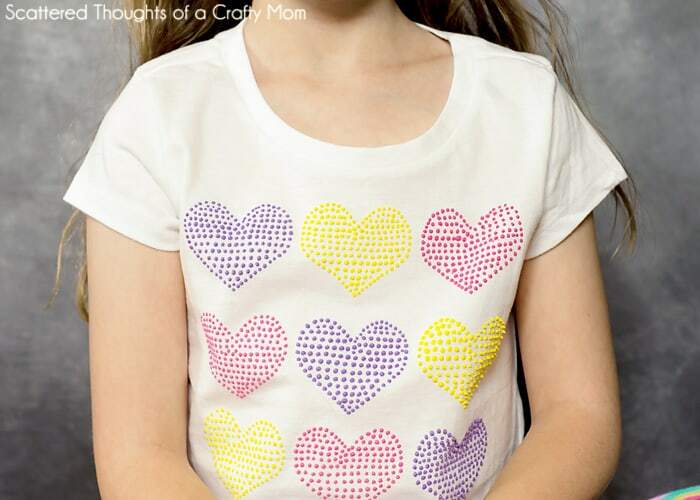 And it was… My daughter loved it, she could not keep her hand off the dots when she first tried on the shirt! Are you ready to make one for yourself? Here is how I did it. T-shirt (I used this one, they are sold out right now, but they always get more. V-necks are still in stock. 1. 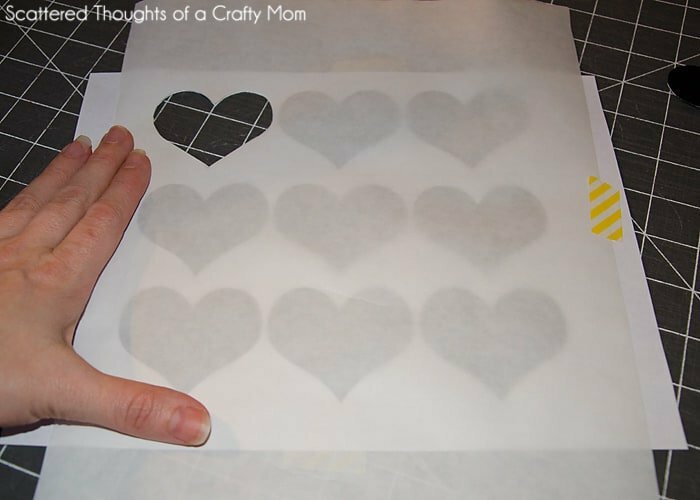 My drawing skills are not the best, so I I like to use freezer paper to create my stenciled images. The process is pretty simple. Print out your image and place it under a piece of freezer paper. Then (preferably on a self healing mat) use an exacto knife to cut out the image. 4. Keep going until you have filled the design with dots. Carefully remove freezer paper while the fabric paint is still wet. If you allow it to dry, it will adhere to the paper in any spots the paint touches the paper. 5. Follow the instructions for your brand of paint on applying steam and how long to wait before laundering. 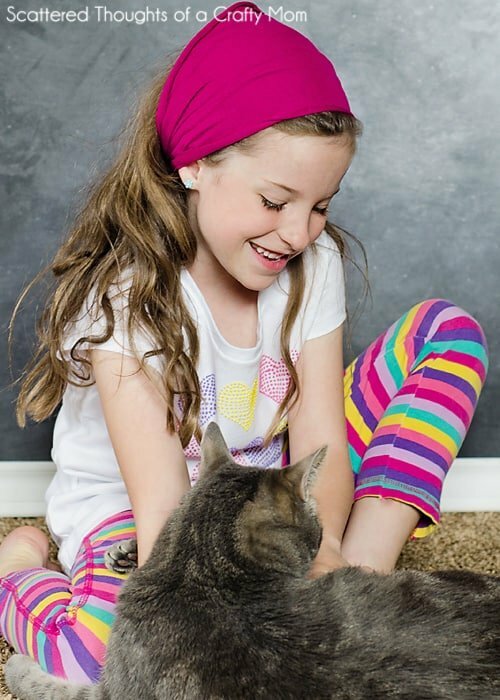 So cute and fresh t-shirt inovation! Adorable! I saw some puffy paint in Hobby Craft on Tuesday, I wish I had bought it now! It's even cuter in person, the shirt didn't really photograph well. Very cute! I not surprised your daughter loves it. 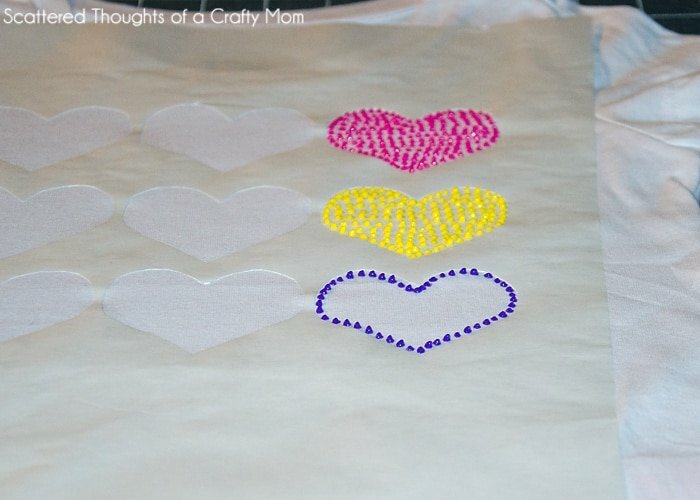 the simple heart shape works so well with all those dots and colours.